Yesterday we created an opt-in mailing list for the Shoes of Prey website. Instead of building it ourselves, as I would usually do, we selected Campaign Monitor as our provider. No wasted development time - no need to reinvent the wheel creating databases, processing email and so on. Reputation - third party providers spend a lot of time ensuring their network isn't blacklisted which greatly improves the chance of delivery. If you're using a shared hosting provider there's a good chance another tenant may be sending spam. This means your emails might end up in the spam folder too. 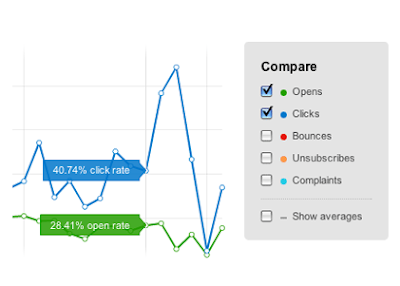 Analytics - lots of pretty graphs and charts so you can understand how your emails were received. We took MailChimp for a spin briefly, however Campaign Monitor won us over with their simple interface and straightforward pricing plan. They simply charge $5 per campaign + 1c per email sent. That's easy to understand, and quite affordable. However, if you are certain you'll be sending at least one email per month, then MailChimp can be cheaper (depending on the volume). If you have an interest in ladies shoes, please join the mailing list, and we'll let you know when the site launches. So here is my question; How are you going to keep it personal? I can't begin to imagine how many things I've subscribed too that I was originally interested in, but then the communcations became generic and my interest wained. Obviously there is another cost/benefit here, but is there not a niche for relationship/customer management that might provide some more perceived value AND a differentiator for your product? Let's discuss over lunch! That's a really good point Dom. I don't know we've thought that far in advance, but perhaps we should. One of the cool things you can do is segment your list, depending on people's interests. So, if they were interested in only flat shoes, you could record that within Campaign Monitor, and only send emails about flat shoes to those people. I guess we're going to have to play it by ear a bit as we learn more about the business.. I definitely agree though, I usually unsubscribe from every single mailing list unless it is 100% relevant. I think the big mistake is people abusing their lists to make a quick buck. Hopefully we don't fall into the trap! Eastbay, and Killer Dana do this really well. They know that based on my previous purchase history, whenever they have new Nike Air Jordan releases or xxxtra short/xxxtra tight boardshorts they should let me know. They also appeal to my tight arse sensibilities by sending me 30% off purchases over $199 and free shipping deals. Someone who does not do it well is Victoria's Secret. They just send me generic updates that is not relevant to what I am really interested in (Intimissimi). Looking forward to seeing the site! basically, all recipients of mailing lists know that they are on a mailing list...what is nice though, is to convince yourself that what you just got had been personalised with YOU in mind. Make your customer feel special and important, and watch the orders flow! CD WOW send me a 50p voucher if I've not ordered for a while with an apology for incase they've done anything to piss me off, and then cheekily put the last item I bought and ask "was it not as good as you thought it would be? Have 50p off the next one on us". Cheeky, easy, but damned effective. oops, never actually made my point! My point was, that if you remember your consumer, then the mailing list is merely the vehicle (an important one at that! ), but its what you do with the information you have about your customers and how you personalise those communications that will ultimately make the difference.